Really Reasonable Ribbon Challenge Sponsored by Wild Orchid Crafts! Don't forget about the Your Next Stamp Blog Hop HERE! You still have through tomorrow at midnight to add your link and be in the drawing to win 3 of the new World Kid stamps!!! Hello! It's time for a new challenge at Really Reasonable Ribbon and this time the theme is Red, Pink, and White! We're so excited to have Wild Orchid Crafts as our sponsor for this challenge, so make sure you visit the Really Reasonable Ribbon Blog to see the fabulous prizes up for grabs! 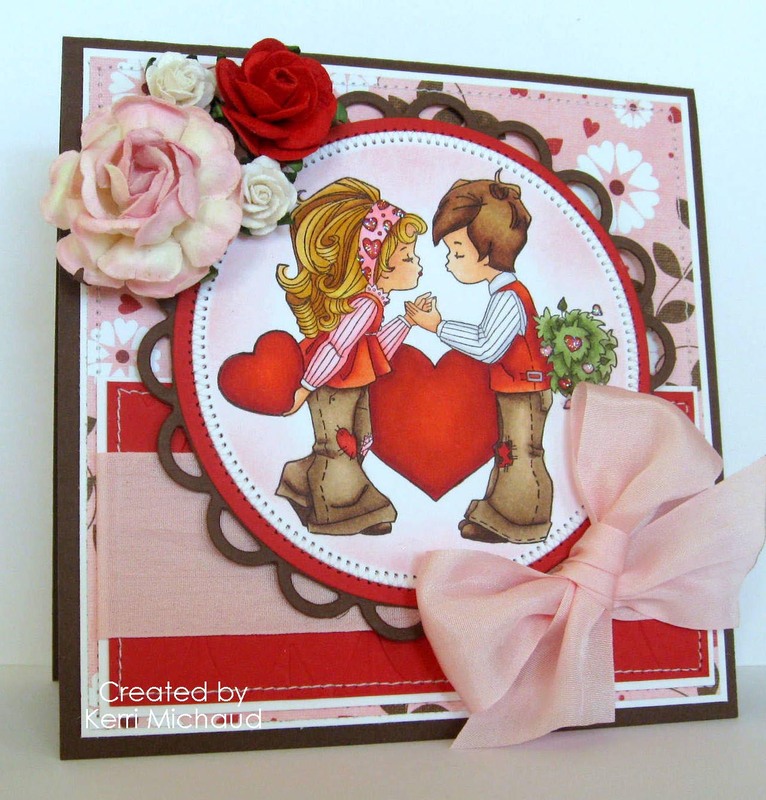 For my card I used this darling image from Belles 'n Whistles called Sweet Love. I used some beautiful paper roses from Wild Orchid Crafts, as well as some GORGEOUS May Arts Pink Silk Ribbon from Really Reasonable Ribbon. The dp is Bo Bunny Love Bandit which you can find at the PaperWorks Co. Store HERE. Thank you so much for stopping by and I hope you have a wonderful day! This is stunning Kerri!! I just love the yummy ribbon, your coloring of the sweet image and all the flowers. Darling!! This card is so so pretty!! Wow, Kerri, this is amazing! I'm loving this card. Soft and elegant! I could be gone for years, not months, and come back and see your coloring, and it still makes me swoon. You've got skills! Love this card! Oh this is beautiful Kerri, & that bow is impressive! Ohhhhh that big pink bow and that big pink rose are soooo pretty....so girly and sweet. And all that coloring...my word...that image is just picture perfect! Very romantic! A wonderful card Kerri. This lovely - what a sweet image! Holy cow! The coloring on this is jaw dropping! Beautiful work, woman!! Adore that big bow too!! Wow! This card is gorgeous! Love the bow, roses and your amazing coloring!!! Kerri, this is absolutely beautiful! Everything about it, your coloring, embellishments...love it! Beautiful Valentine, this image is just darling and fabulous coloring. Oh my, just adorable and your coloring is fantastic! WOW, this is just beautiful. Love your coloring and that gorgeous bow! !